Do you remember a time when bottled water wasn’t a thing, and we weren’t afraid of the tap or a drinking fountain? How did this change come about? Why were we suckered into believing bottled water was safer for us than the water coming out of the faucet? How did bottled water become a booming $100 billion year business in just the US?1)http://www.businessinsider.com/facts-bottled-water-industry-2011-10 Why do we think it better to drink water shipped halfway around the world? Even the environmental impact of delivering all that bottled water is profound, both from overseas (Fiji Water, Pellegrino) and distribution to stores in the US. It takes a fleet of 40,000 18-wheelers just to deliver our bottle water every week! It takes three times the amount of water bottled to make it. 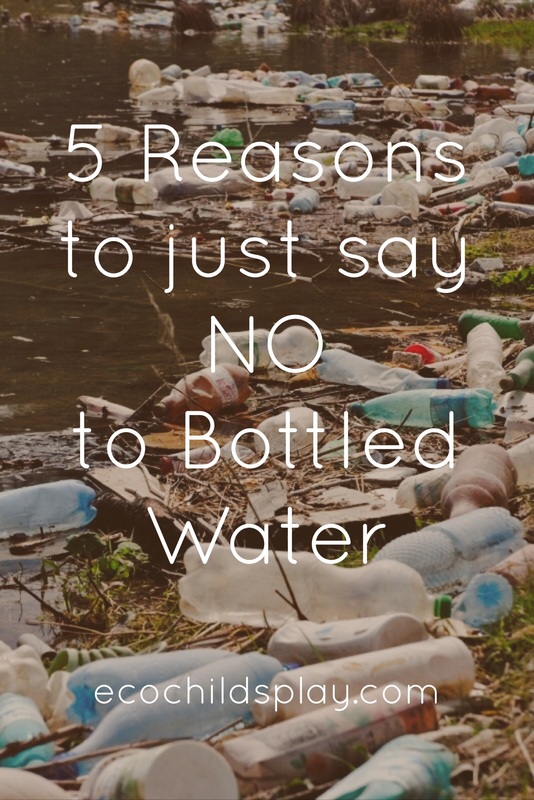 The water used in the process is laden with chemicals and thus not reused.7)http://www.huffingtonpost.com/norm-schriever/post_5218_b_3613577.html For every gallon water bottled, three gallons are wasted in the process. Bottled water has come under a lot of scrutinies in drought-stricken California mainly for the local aquifers that are drained by water companies. There is 110 water bottling plants in California. 3.1 billion gallons of California water is bottled at these sites.8)http://money.cnn.com/2015/05/26/news/companies/california-bottled-water-drought/ Multiple this number by three, and you find that 6.2 billion gallons of water are needlessly wasted each year because Americans are fooled into thinking it is safer than tap. 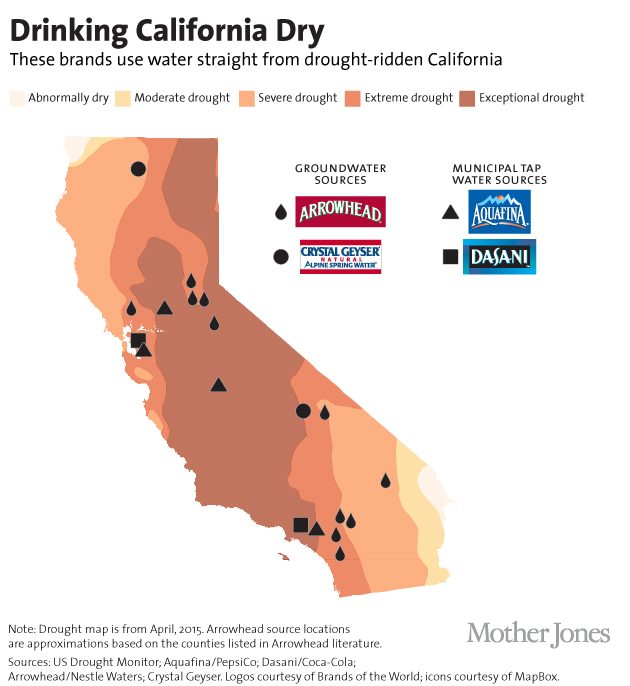 We’ve been duped into thinking our tap water is not safe, but 45% of all bottled water is actually tap water rebottled, purified, branded and sold to consumers9)http://www.motherjones.com/environment/2014/08/bottled-water-california-drought. I can’t help but be reminded of the scene in Slumdog Millionaire where they are refilling bottles of water from the tap in the restaurant. It is true that there are instances where city drinking water has been very unsafe to consume. The lead in Flint, Michigan’s water being a case in point.12)http://www.cnn.com/2016/01/11/health/toxic-tap-water-flint-michigan/. These cases are less common than the large consumption of bottled water would lead one to believe. Always carry a refillable water bottle with you. Many drinking fountains now are also refilling stations. I have seen them in airports, schools, and ski resorts. There is rarely a need to buy bottled water when you come prepared with your own bottle. One unique refillable water bottle we were sent to try is called the Pocket Bottle. 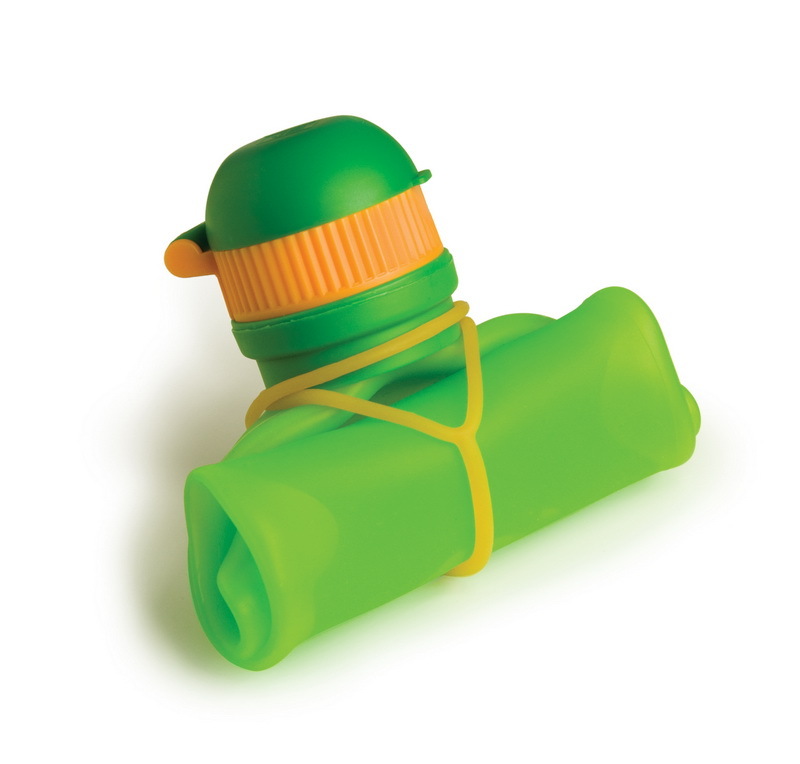 It is a collapsible silicone bottle. It smooshes and morphs to fit easily into any bag or purse. It is safe for either hot or cold beverages. Crafted in BPA-Free, non-toxic, and FDA approved silicone and polypropylene, PocketBottle is ideal for hydration on the go, including all forms of outdoor activities such as running, hiking, cycling, and boating, as well as trips to the gym, the office, beach, pool, and more. PocketBottle preserves the environment by offering a “green” solution to disposable water bottles made from BPA-containing materials that clog landfills. The ultimate in space-saving storage, PocketBottle folds down like an empty toothpaste tube to fit compactly into a pocket or bag when not in use. 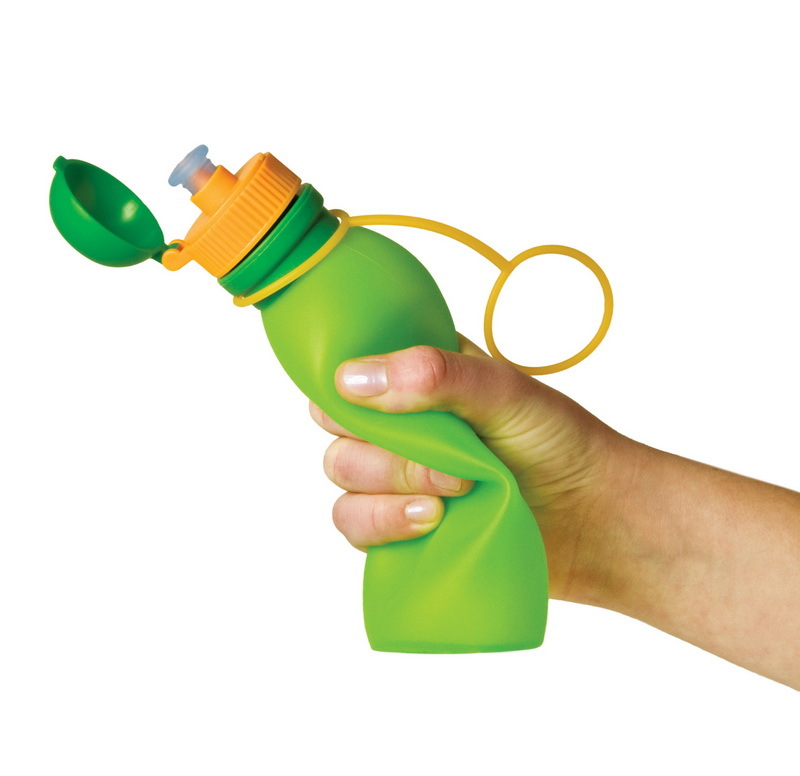 PocketBottle’s ingeniously collapsed shape is secured with a well-designed, double-sided O-ring that easily wraps around the folded bottle. PocketBottle’s ergonomically slim and lightweight design allows for easy holding when filled with water, juice, and other liquids, and features a fool-proof latching cap that “clicks” closed to ensure a leak-free seal. As an added convenience, a double- sided O-ring fastens down the bottle when folded for the ultimate in space-saving storage. Do yourself and the planet a favor…purchase a home filtration and/or purification system and use reusable glass or stainless steel water bottles. We should not avoid bottle water completely, but we should not take bottle water if we have alternative option. If you look at your drinking water through this passes of a 5-micron sediment filter, there are some particulars like dirt, silt, and rust. These will affect the taste and get up to your water, and clog the system. However today supply water contains impurities and pathogens that can cause death, so be careful while choosing the purifier. Check this page- http://www.ewaterpurifier.com/tactics-to-choose-the-best-ro-system/ basically a revers osmosis purifier. That said, I do keep a couple of cases of bottled water on hand for emergency preparedness, but I’m not a daily consumer of bottle water for the reasons you stated. Pinning this article!